Guys, I absolutely love Rocket League and am glad your DLC is reasonably priced. I didn’t get a chance to play SARPBC but welcome more content, even if the majority of it just is cars and cosmetics! Could you add a Cowboy hat for a topper by chance? We’ve seen this request a few times. We’ll look into this one! Yes! More DLC! Love this game so I am glad to support, especially since the game was a PSN plus freebie when it came out. Schweeet! Looking forward to those new unusual arenas. And I’m happy to see the return of 2 of the coolest classic cars from Supersonic Acrobatic Rocket-Powered Battle Cars! Bring it on guys! 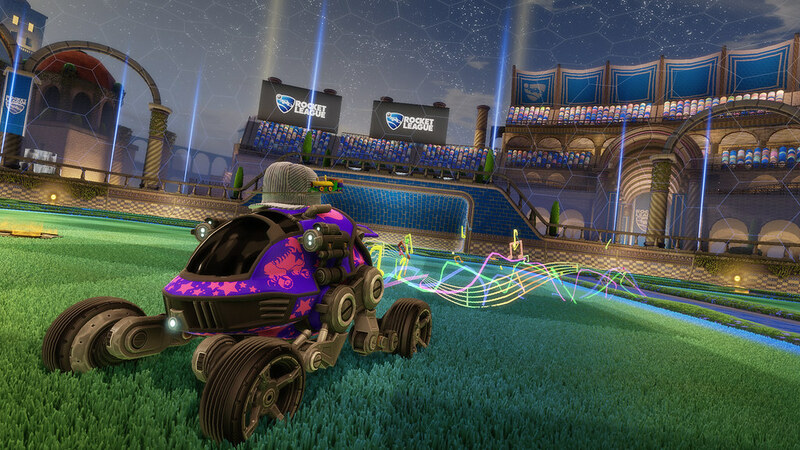 Awesome work with keeping Rocket League alive. It’s a real blast! It’s awesome guys. Thanks for all the hard work. You aren’t supporting a game you don’t own…. seems overly logical to me. I hope the Sound bug is fixed in the next Patch. Currently all of my friends including myself ran into this bug where no sound would play from the game and the only way to fix it is to restart the game. Also is there a way that USB Music and Spotify Music display the Song details for the song that’s playing when it switches song’s. If not a feature yet hopefully will be added to the game and or upcoming Firmware update for PlayStation 4. The sound bug you’re referring to should be fixed in the next patch. We’ve had very promising results from our testing regarding that one, so it’s looking good there. Thanks for sticking with us on that one! Awesome, keep it coming. Love the game. If you could release a more specific release date when you know it would be much appreciated. Will do. We want to make sure of our date before we announce a specific one. But that’s in the plans! You people got The Magic in you. Feeling a totally justified all-caps WOOHOO coming on! WOOHOOOOOO!!!!! Less DLCs with trophies pls, I want to be done with playing this game. How shameful….you trophy whor*s are a real plague. Keep the trophies coming! I love these Dlc drops, you’ll have my money if you keep giving me a reason to come back! 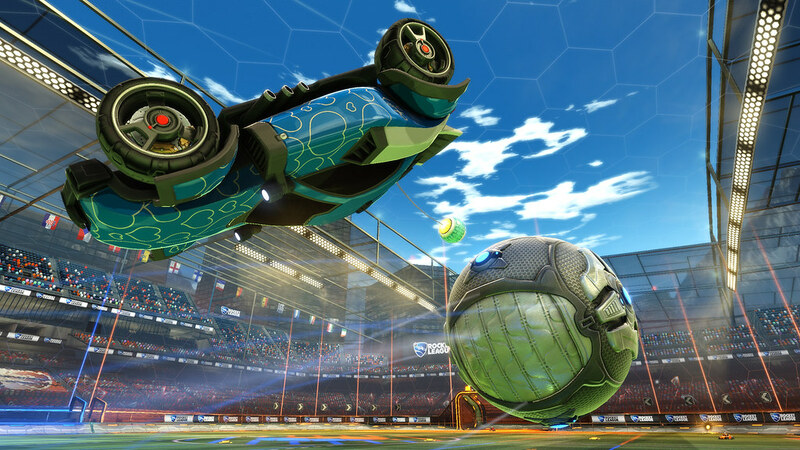 I love Rocket League and play it daily! These DLCs are fine, but nothing extraordinary. I also don’t quite get the “Season” that just started on the Ranked matches… If one day i have 120 points, on the next day i’m back to 100 and if one day I’m down at 80 and unranked, the next day I’m back at 100 and Bronze I. Also it would be great if we could make a small tournament between teams. Like the Soccer World Cup. Anyway… I love this game and there are so many ways to make it bigger and better! Keep updates and DLCs coming and this might be the GOTY. first of all let me say i love rocket league. now for the important matter, i know this probably isn’t the right place to ask the question but for anyone who knows the answer, was the PS plus”vote to play” just for last month? because in two weeks it’s gonna be october and i haven’t seen any info yet on the new games to vote for. They won’t be doing it this month. I think is going to be a “once in a while” sort of thing. 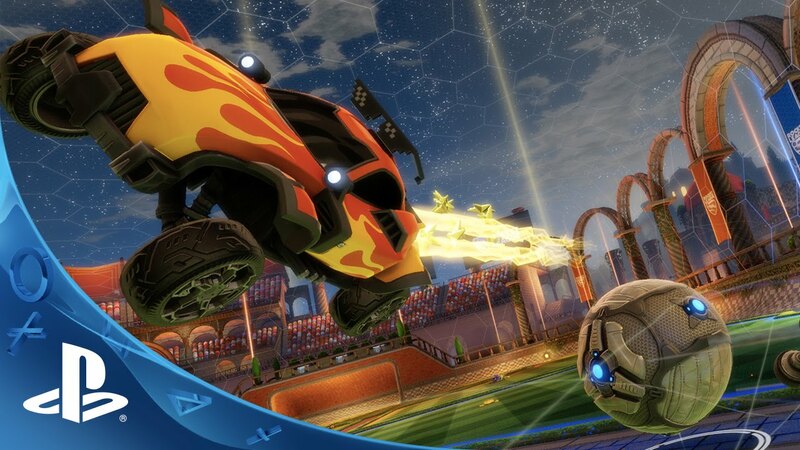 Haven’t had time to play it yet but I played SARPBC back in the day and I bet Rocket League is really fun…anyway nice job on the support for the game and congratulations on its success. I would very much like to see online season if thats possible, with tags and team based matches. Could be at least short season. AAAND BALL SKINS! That’s the car I want in the game the most. It would just be so epic. Also, it’d be very random but a supercharged golf cart would be hilarious lol. Love the game! Looking for some friends to play online. Add me if interested. I pretty much just buy the Rocket League DLC to support the game. I do however get all the trophies which I normally don’t care about. Great Game! My go-to before bed game. Absolutely loving this game! This DLC looks awesome. I never played Supersonic Acrobatic Rocket-Powered Battle-Cars but the new cars look sweet! Not sure what the team’s vision is for this game and how crazy you want to go, but I think Mech models would be super sweet! Thanks for this awesome game! You really need a report button or something, people are so toxic and calling people so many things that it aint fun to play sometimes. some even goes afk or score own goals just to troll around. this is for pc btw. Like the others have said – I’ve really enjoyed playing this game, and don’t mind purchasing the DLC to show my support since both the game and DLC are reasonably priced. I’ve put in quite a few hours, but the one thing that would keep me coming and IMO adds quite a bit of replay value, is a multi-player season mode. The current ranked season mode is a bit confusing. Since I almost exclusively only play this game with other friends, I’d love to see an online / multi-player season mode where my friend(s) and I could go through a season together vs. AI OR other random gamers. Can something like that be added to the backlog? Is there going to be a way to make our own song list?Like taking it from a usb and making a tracklist ingame?that would be awesome! thanks regardless you reply or not. Razor, Just get spotify on your playstation (it is free) and then you can use that to play music while in game. Thats what I do and it works wonderfully. I’ve always loved Rocket League but with the DLC packs makes me love it even more so thank you for making such a great game! When is this coming to Asia?? I was so disappointed to find out it was unavailable after I bought my PS4… PLEASE PLEASE PLEASE, bring it to Asia!!!! Do epople spend money on things that are this trivial? For me I buy it because I didn’t spend any money on purchasing the game. And I will buy ALL DLC because this game deserves to be supported. The best “oh ok one more match” game ever. The first DLC is at a good price for Brazil (BRL). I hope thisi s too! Hello best developers ever! Are you aware of the bug where you are not able to select any options after finishing a match? You are not able to start a new game, nor leave. Oh. And I really really love that Zippy with hearts will return!! I am going to for sure buy all the DLC, not because I need it. Sure I do “want” it but I mostly want to support you guys. You have made a quality game that has kept my attention and interest more than AAA games that have a way bigger budget.